The approval of Orthoclone OKT3® (muromonab-CD3) in 1986 marked the first appearance of monoclonal antibodies in the clinic. In the over 20 years since, more than 70 antibodies have been approved for therapeutic or diagnostic use, representing over 50% of the overall biotherapeutic market. The spectacular success of this class of therapeutics is due to some crucial advantages over small molecules, such as their high specificity and lack of genotoxicity. However, the preclinical development of these biomolecules poses unique challenges. Antibodies in particular display a high level of species-specificity not only in target binding through the variable region, but also in the Fc region which is vital in maintaining long term stability. How stable is the antibody? A crucial question often addressed during preclinical development focuses on the in vivo stability of therapeutic antibodies. Increasing the half-life of a therapeutic antibody has several benefits ranging from higher treatment efficacy to increased advantages for the patients who will have a fewer number of therapy sessions and a reduced cost. 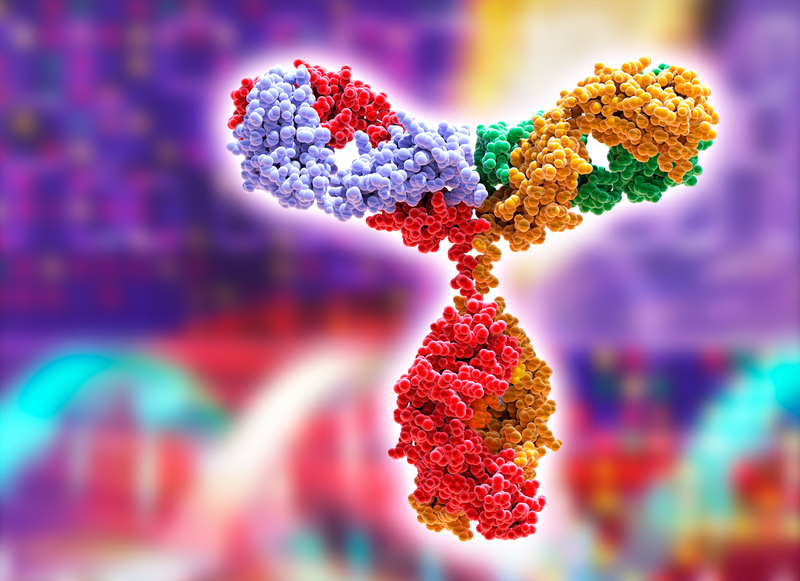 Given these compelling benefits, following the identification of therapeutic antibodies with the desired specificity, developers usually subject them to a refinement step to increase their stability. This process is often hindered by the lack of reliable experimental tools to predict the half-life of antibodies in patients. The major hurdle of using mouse models to predict antibody stability in the serum lies in the way immunoglobulin proteins are processed by the organism. In mammals, most proteins circulating in the serum undergo constant uptake by endothelial cells and are routed through the endosomes to the lysosomal compartment for degradation. In the endosomes, immunoglobulin G (IgG) proteins are recognized and bound by a transmembrane protein, called the neonatal Fc receptor (FcRn), which mediates their recycling to the plasma membrane and subsequent release back into the serum. As a result, the half-life of IgGs are significantly extended by this mechanism. Since most therapeutic antibodies belong to the IgG class, this recycling system is very relevant for their relative stability in the body. Remarkably, the relative affinity between IgGs and FcRn is extremely disparate between different species, with the mouse receptor showing a much higher affinity than its human counterpart. This difference between mouse and human FcRn has previously posed a serious obstacle in the use of murine models to test the stability of therapeutic antibodies. To overcome this limitation, Derry Roopenian and colleagues at The Jackson Laboratory developed a series of mouse models carrying the human FcRn receptor gene and lacking its mouse counterpart (Roopenian et al., 2010). These mice have been extensively studied to determine whether they can faithfully mirror the human catabolism of IgGs. As part of this characterization effort, researchers at the Pharmaceutical Research and Early Development group at Hoffman-La Roche and the Pharmacokinetics Dynamics & Metabolism group at Pfizer have studied the pattern and level of expression from the transgene, confirming that these animals exhibit a physiological expression of the human FcRn (Latvala S et al., 2017; Fan YY et al., 2016). The function of the human neonatal FcRn protein has been subsequently confirmed in a 2013 study conducted by scientists at Janssen. They used different variants of the same antibody under clinical development and eight antibodies currently used in clinical settings. The authors demonstrated a remarkable correlation in the stability of humanized antibodies in humanized FcRn mice compared to both non-human primates and patients (Tam SH et al., 2013). Furthermore, a very extensive study by scientists at Pfizer has subsequently confirmed the reliability of the humanized FcRn mice for predicting therapeutic IgG stability in humans. In this study, the group at Pfizer compared the pharmacokinetic behavior of 27 monoclonal antibodies in WT and FcRn humanized mice, non-human primates and, when the data was available, in patients (Avery LB et al., 2016). The results were striking: the transgenic mice were not only more predictive of the clinical situation than WT mice, as expected, but they also performed better than non-human primates in mirroring the stability of the therapeutic antibodies in patients. The early preclinical assessment of antibody stability affects several aspects of therapeutic antibody development, from the possibility of focusing resources on the variants with the most likelihood of working in the clinic to providing a better evaluation of the dosing in first-in-human clinical trials. The introduction of an in vivo platform comprised of humanized transgenic mouse models predictive of the human situation provides researchers with new tools to select the most stable antibodies early in the development process. In turn, by focusing their resources on the most promising molecules, drug developers can increase the rate of success in their pipeline and reduce the time needed to bring effective therapies to the clinic. The FcRn platform from JAX mimics specific aspects of the human IgG physiology and provides the ideal solution to assess the half-life of different antibodies and antibody variants in the early phases of drug development. Furthermore, these models provide the most reliable and validated method to predict the stability in humans of therapeutic antibodies and antibody variants in a time and cost-efficient manner. To learn more about these models, visit jax.org/fcrn. Avery LB, Wang M, Kavosi MS, Joyce M, Kurz JC, Fan YY, Dowty ME, Zhang M, Zhang Y, Cheng A, Hua F, Jones HM, Neubert H, Polzer RJ, O’Hara DM. 2016. Utility of a human FcRn transgenic mouse model in drug discovery for early assessment and prediction of human pharmacokinetics of monoclonal antibodies. mAbs. 8(6):1064-78. DOI: 10.1080/19420862.2016.1193660. Fan YY, Avery LB, Wang M, O’Hara DM, Leung S, Neubert H.2016. Tissue expression profile of human neonatal Fc receptor (FcRn) in Tg32transgenic mice. mAbs. 8(5):848-53. DOI: 10.1080/19420862.2016.1178436. Latvala S, Jacobsen B, Otteneder MB, Herrmann A, Kronenberg S. 2017. Distribution of FcRn Across Species and Tissues. J Histochem Cytochem. 65(6) 321 –333. DOI: 10.1369/0022155417705095. Roopenian DC, Christianson GJ, Sproule TJ. 2010. Human FcRn transgenic mice for pharmacokinetic evaluation of therapeutic antibodies. Methods Mol Biol. 602:93-104. DOI: 10.1007/978-1-60761-058-8_6. Tam SH, McCarthy SG, Brosnan K, Goldberg KM, Scallon BJ. 2013. Correlations between pharmacokinetics of IgG antibodies in primates vs. FcRn-transgenic mice reveal a rodent model with predictive capabilities. MAbs. 5(3):397-405. DOI: 10.4161/mabs.23836.